Lunch. 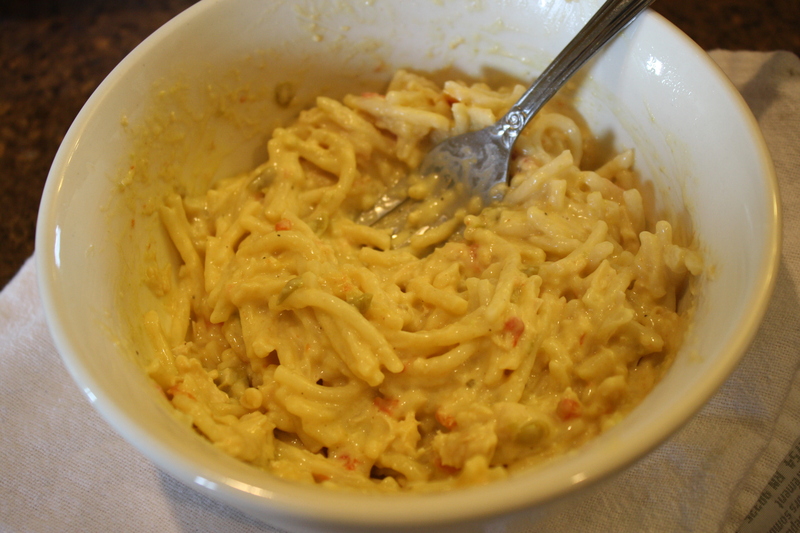 Someone shared some chicken rotel. Delish and day-making stuff here. Not that today was an especially tough day, but just knowing someone thought of me and took the time to include me in their meal made it such a nice day. I think I need to share food like she did more often, but I am afraid to. What if what I make to share is gross or makes them sick? What if they have an allergy? What if it is too cold/hot/spicy? I guess I shouldn’t worry. It is the thought that counts, right? Sharing a meal with someone is one of my favorite things. Food is fun, but food with company is a party. I think I’ll get over this food sharing fear and go make a pie to share tomorrow. Have a great week, Foodie Friends. 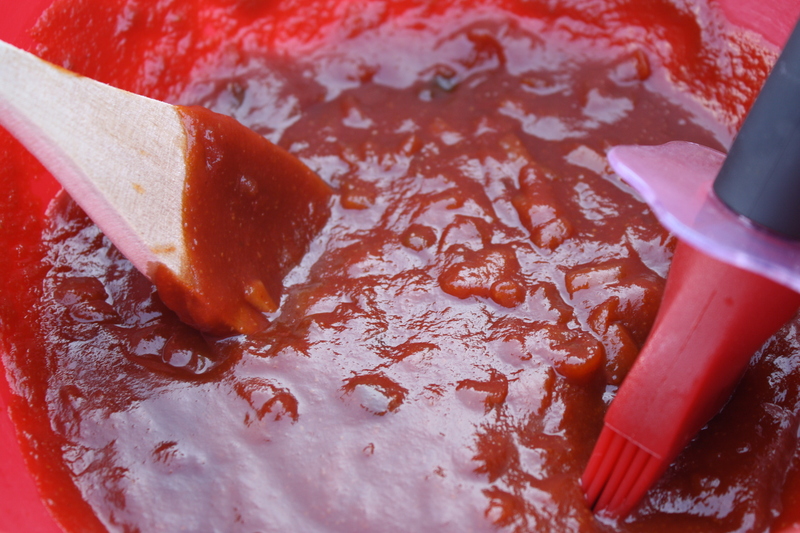 Several years ago, I found a recipe for a homemade bar-b-que sauce that looked interesting. It had everything under the sun in it, and I just so happened to have that much stuff in the pantry. 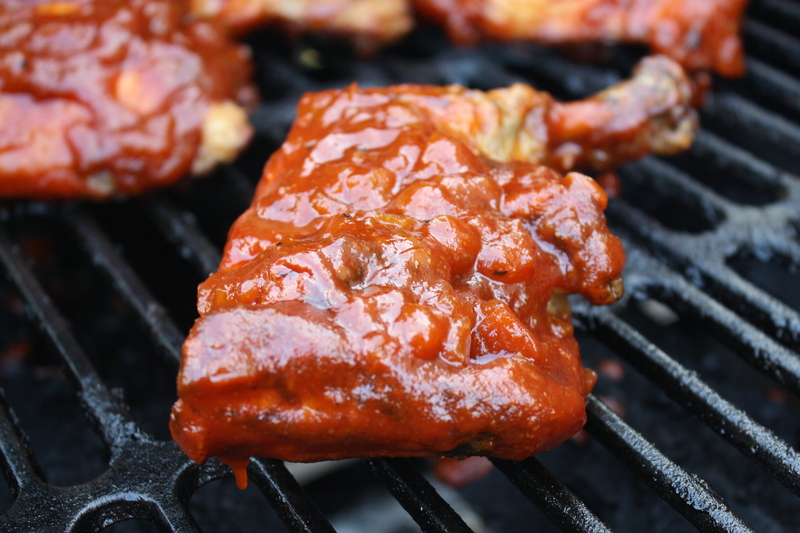 I have been making my own version of this sauce ever since-especially during grilling season. I only slather it on chicken, but I am sure it would be great on other things like a burger or a pork chop. 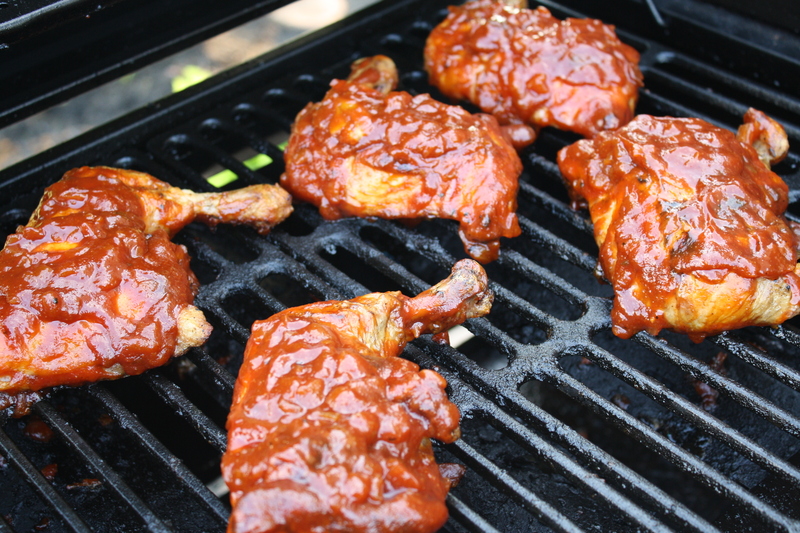 It just does the best job on chicken on the grill. The ingredients are 1 large onion diced, 1 1/2 cups of Hunt’s ketchup, 1/4 cup brown sugar, 1/4 cup of honey, 1 T liquid smoke, 1 T molasses, 1 T spicy brown mustard, 1/2 T white wine vinegar, 1 T worchesshire, 1 t ceyenne, 2 smashed cloves of garlic, 1 T chopped pickled jalepeno, 1 T soy sauce, salt, and pepper. To make the sauce, all you do is combine everything in a saucepan on medium for about thirty minutes. If it boils, turn it down to simmer. This recipe could easily be doubled or tripled, but I only make enough for one meal at a time. I think she enjoyed it. The proof was that she brought me back my plate-clean and washed-and told me I could make that chicken again anytime I liked. Just look at all that stuff! This is ready to serve but without the sauce and rice. 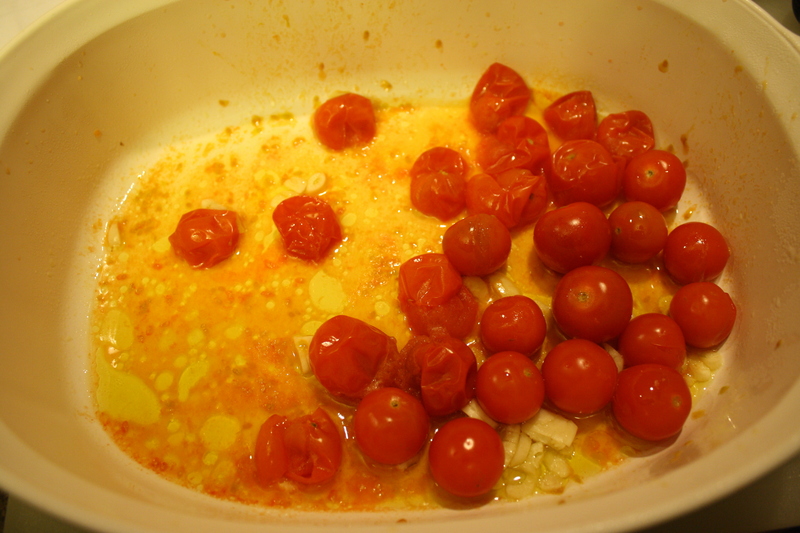 The sauce during the thickening process. Then I remember. Because it is fancy, time-consuming, expensive, and complicated. In other words, because I am trying to show off my cullinary skills. Go, me. 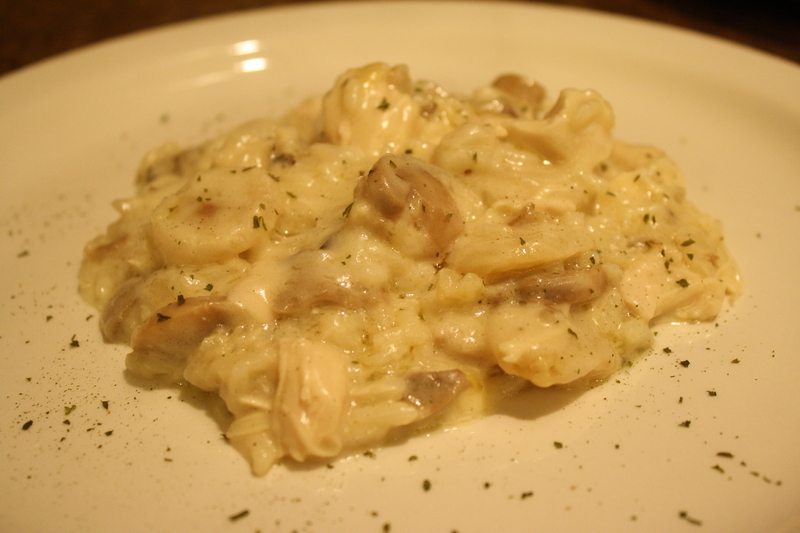 It is fun just to say the name of this dish. It is sooo French, and I am sooo not French. This dish doesn’t fit in ’round these parts. I love that. My recipe is a mish-mash of cookbooks/trials and errors/Food Network shows. Start early as this process takes afternoon and finish with a “Sha-zam!” or something to that effect. And be prepared to repeat the title in a fancy way many times to those to whom you are serving it. In a medium pot, boil salted water. Add whole pearl onions and boil for three minutes. Drain, cool, cut off the root end, peel. Season the chicken with salt and pepper. Set aside. Cut the bacon into one-inch chunks. In a large, oven-proof, deep skillet, cook the bacon until crisp. Drain on a paper towel. Remove most of the bacon fat from the pan. Leave about two tablespoons to season. In the same pan, add the butter, onions, celery, and carrots. Heat over medium for five minutes or until the onions start to brown. Remove the vegetables with a slotted spoon. 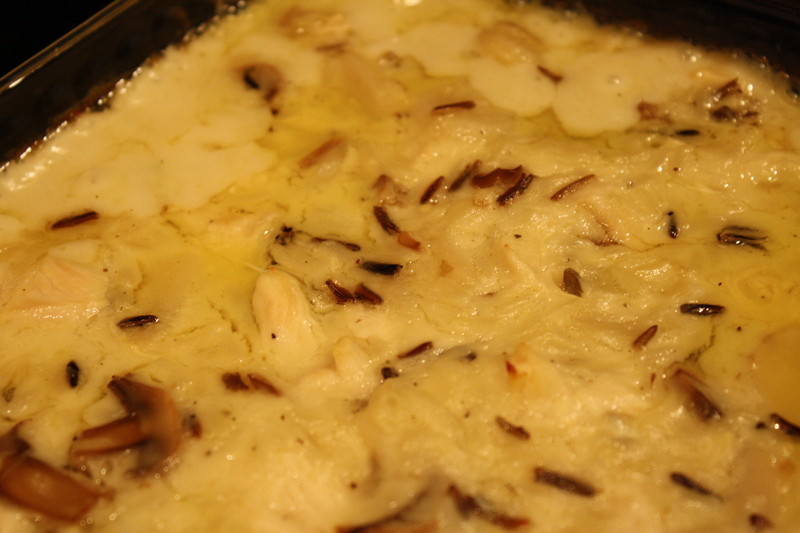 In the same pan again, heat the mushrooms. Same thing here-medium heat for five minutes. Remove with a slotted spoon. Set aside with everything else. Now, the chicken. Preheat your oven to 350. In the same pan that everything else was in (if necessary, add little butter), brown the chicken for three minutes on each side. It will get nice and happy. When you’ve crisped both sides, sprinkle the tops of the thighs with the flour. Spread it around, but don’t worry about the bottoms. Once sprinkled thoroughly, put the chicken in the preheated oven for five minutes. Remove the chicken after time is up, and drop the heat to 250. Now, we start adding things. Add the garlic to the chicken. Add most of your wine, about three-fourths of the bottle. Return the pan to the stove on medium heat. Add the two thyme sprigs whole along with the parsley, bay leaves, bacon, and vegetables. Stir as best your can without making a huge mess. At this point, I like to add the stock to the top to dilute the wine a little as most of my family doesn’t care for wine. You may want to add the rest of the wine to cover the chicken. You may want to drink the wine and cover with the stock. Regardless, cover the chicken with something. Cover the pan and return everything to the oven where it will set for one and a half hours. When time is up, remove the pan from the oven. On a plate, pull out the chicken and vegetables. Remove the skins from the chicken and discard. Also discard the herbs. They’ve all done their part to flavor this menagerie. Add salt and pepper. 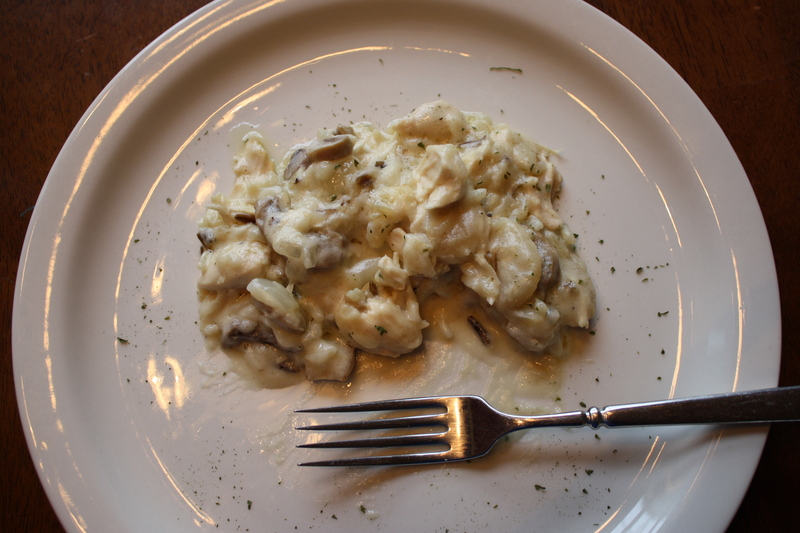 With the sauce left in the pan, add one tablespoon of butter and a tablespoon of flour. Boil until thickened. Serve the chicken, vegetables, and gravy on a large platter with rice or noodles. Add salt and pepper before serving. Viola! 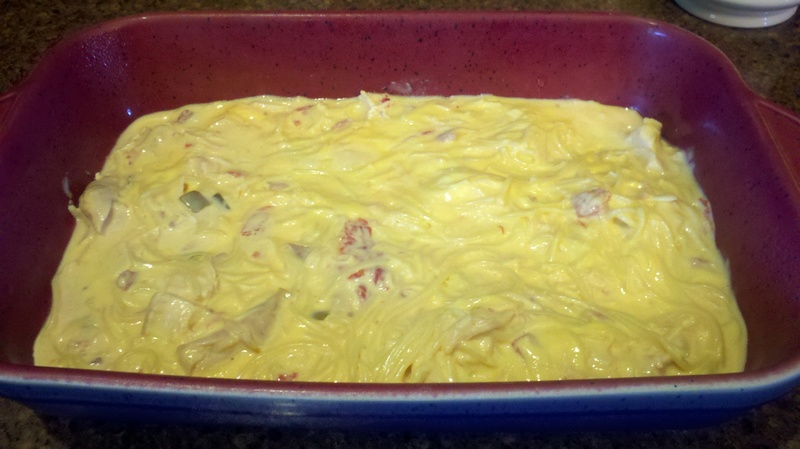 The most perfect food in the world may very well be a creamy, rich concoction called chicken rotel. It has long been a favorite of mine, and I thought everyone knew of its wonder. I learned recently, though, while talking to a friend of mine not from around here that its awesomeness was not worldwide. Shame. Aside from its abilities to warm the tummy and heart, this recipe is also great because of its flexibility. It is highly modifiable. Want more chicken? Noodles? More creamy, rich cheese? Adjust all you want. In a large pot, cover your chicken with water. Add salt and pepper and bring to a boil. Allow to slowly boil for almost an hour. The meat should fall off the bone when you pick up a piece. When your chicken is done, pull it out of the water to cool. In the same water that you cooked the chicken in, cook your spaghetti following the package directions. Save a little of the broth-about half a cup- to thin things out if necessary later. When the chicken is cool enough, pull the meat off the bone. 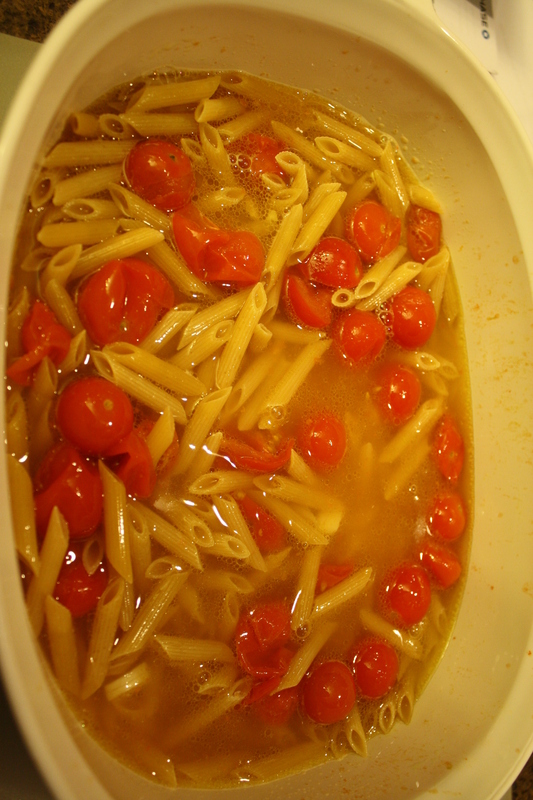 In a large bowl, mix everything together while your pasta is warm. If it looks a little thick, add the broth but don’t make it too soupy unless you want it that way. This will melt the cheese and make a gooey wonder. Ahhh. When the mixture is mixed, spread it in a pretty casserole and warm it at 350 for 20 minutes. 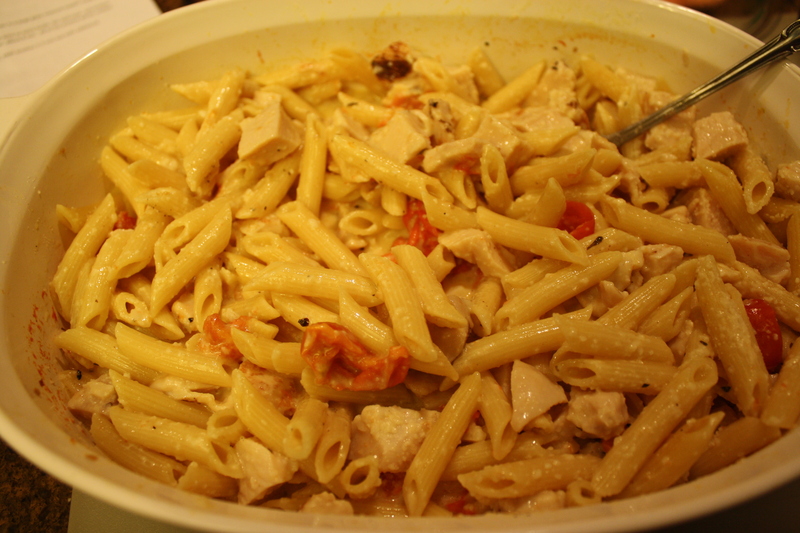 You’ve got it all here: cheese, pasta, chicken. It is devine.